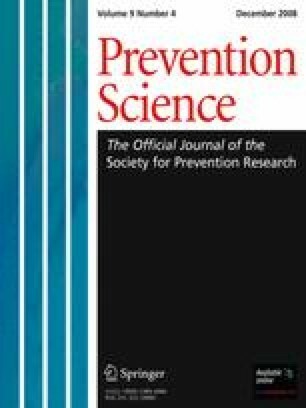 Teacher- and school-level factors influence the fidelity of implementation of school-based prevention and social character and development (SACD) programs. Using a diffusion of innovations framework, the relationships among teacher beliefs and attitudes towards a prevention/SACD program and the influence of a school’s administrative support and perceptions of school connectedness, characteristics of a school’s climate, were specified in two cross-sectional mediation models of program implementation. Implementation was defined as the amount of the programs’ curriculum delivered (e.g., lessons taught), and use of program-specific materials in the classroom (e.g., ICU boxes and notes) and in relation to school-wide activities (e.g., participation in assemblies). Teachers from 10 elementary schools completed year-end process evaluation reports for year 2 (N = 171) and 3 (N = 191) of a multi-year trial. Classroom and school-wide material usage were each favorably associated with the amount of the curriculum delivered, which were associated with teachers’ attitudes toward the program which, in turn, were related to teachers’ beliefs about SACD. These, in turn, were associated with teachers’ perceptions of school climate. Perceptions of school climate were indirectly related to classroom material usage and both indirectly and directly related to the use of school-wide activities. Program developers need to consider the importance of a supportive environment on program implementation and attempt to incorporate models of successful school leadership and collaboration among teachers that foster a climate promoting cohesiveness, shared visions, and support. Brian R. Flay was at the University of Illinois at Chicago when this project started. Two of the authors, Flay and Allred, are married. This project was funded by the National Institute on Drug Abuse, grant #R01-DA13474. State of Hawaii Department of Education Systems of Accountability. (2006). School accountability: School status and improvement report. Retrieved 11/28, 2006, from http://arch.k12.hi.us/school/ssir/ssir.html#.